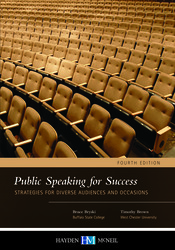 Public Speaking for Success: Strategies for Diverse Audiences and Occasions is a textbook that helps beginning and advanced speakers create, develop, organize, and deliver effective messages in public, group, and interpersonal settings. The textbook uses concrete examples and sound advice to instill confidence, direction, knowledge, and understanding for students learning how to make effective presentations. The authors, Bruce Bryski and Timothy Brown, have over twenty years of teaching experience as well as extensive business experience in the field of speech communication. Written in a sensible, inviting style, this text will help you to inspire your students to become more effective public speakers.